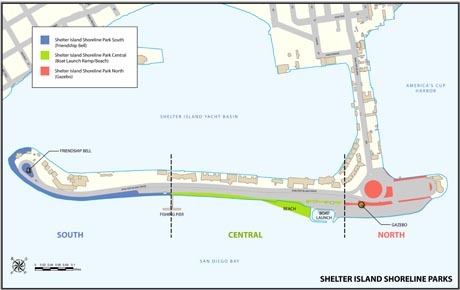 Shelter Island is located at the north end of San Diego Bay. It is connected to the mainland by a narrow strip of land so the "island" is not really an island. Shelter Island is only about 1.2 miles long, few hundred yards wide and served by a single street, Shelter Island Drive. This hub of activity features incredible views of the Bay and has all the amenities for a great vacation spot including hotels, restaurants, marinas and a park with a fishing pier. Shelter Island is convenient to America's Cup Harbor, a major launching point for sport fishing expeditions. Shelter Island is surrounded by marinas and four boutique hotels where you can indulge with spa services, dine at fine restaurants and be treated with nice romantic views. The Bay Club Hotel and Marina, Humphrey’s Half Moon Inn & Suites, Best Western Island Palms Hotel & Marina and Kona Kai Resort and Spa form the Shelter Island Village. Under the Big Bay evening skies, Humphrey’s rounds out the lure of the village with its famous Concerts by the Bay series, which run June through October. The Bali Hai Restaurant is one of four dock-and-dine spots on Shelter Island. It features one 90-foot dock that leads you from your boat to paths through the Bali Hai gardens and around the island. 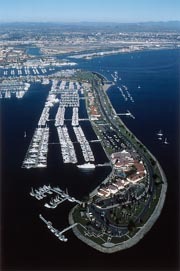 Shelter Island contains one yacht club, the Silvergate Yacht Club, and it creates a sheltered harbor for two others, the San Diego Yacht Club and the Southwestern Yacht Club. Shelter Island is known as a destination for superyachts because it contains one of the few marinas in San Diego Bay with a deep enough harbor for these over-sized vessels. The Annual YachtFest, spotlighting superyachts, is held at Shelter Island Marina every September. The event also features mock gunbattles between two replicas of 19th century tall ships from the collection of the San Diego Maritime Museum. A concrete boardwalk extends the length of Shelter Island and its Shelter Island Shoreline Park. The park is a great place to stroll and absorb the panoramic views of San Diego Bay and the marinas. You can also catch views of Point Loma, the San Diego Skyline and Coronado Bridge. This beautiful park features a fishing pier, boat launch ramp, a children's playground, picnic tables, a gazebo. trees, lush landscaping. fire rings. plenty of grassy area, concessions, and a small sandy beach. Often, groups of local artists display their works on the park grounds. The park is a popular location for viewing Fourth of July fireworks and the December Holiday Lights Boat Parade on San Diego Bay. Generally there is plenty of free parking available, but on holidays be sure to get there early.